Update and Michael – Kick-off to Fight the Good Fight! 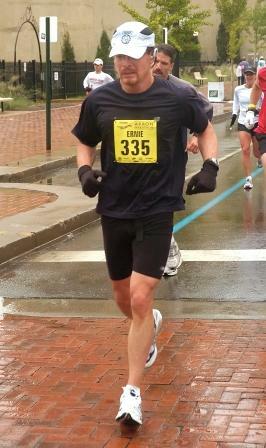 Ran the Glass City Marathon yesterday with lots of rain, great volunteers, and some awesome runners. Made my goal of new best GCM time of 3:38:42 which was 4:16 faster than my previous time set way back in 2006! Don’t feel so old today! Woohoo! That’s one race down, 2 to go…for my Honorees…for LLS…for a cure! Go Team! If you missed it, check out the plan. Next race is the North Country 50 Miler on August 24th so ultra-marathon training starts today! Thanks to Liz Schier, Dave Schlaudecker, Deb Spero, Karen Landis, and Steve Grindle and the staff at Champion Credit Union for early donations and pledges for the cause. You guys are awesome! We are on our way! “…my nephew Michael Warren in Dayton who suffers from lymphoma after being diagnosed about a year ago. He’s undergone many rounds of chemo so far and the prognosis isn’t good due to his on-going infections….but he’s gotten cleared enough for a bone marrow transplant in the next month and has his match. It’s grim based on the health he’s in and withering away of his body and strength. However, it’s his only real hope and he’s prepared to fight hard. He’s only 28. He was a full time airman at Wright Patterson AFB in the aerospace medicine field when he was diagnosed. Michael was always a star athlete, very successful in soccer. He misses it a lot. He loves sports, the Cincinnati Reds & OSU anything. Keep Michael in your prayers as well as all of our 152 Honorees so they know that we are with them every single solitary moment! Fight the good fight Baby! Finally, we need your help to reach our $5,000 fundraising goal! Please make a donation in support of all of our efforts with Team In Training and the Leukemia and Lymphoma Society to help advance the research for cures for all! It won’t be easy…it never is…but it will be worth it! If you have a family member or friend with cancer or lost to cancer that I can run for, send me their name and their story. I would be honored to run for them! And, thank you for your support… Run Steady, Run Strong! This entry was posted in Running and tagged Honorees, LLS, Marathon, Motivation, Oil Creek 100, Running, Team In Training, TNT, Ultra-marathon. Bookmark the permalink.